I am so glad you found this page because baseball is such a great game and I want you to understand how to play baseball. If you understand how the game is played you will enjoy watching it that much more. And maybe with a little luck you will get to play a backyard game of baseball. As you are probably aware, baseball is very popular in many countries around the world. A few good players are paid lots of money to play baseball. And they, like millions of other people, started playing baseball at a young age. It is a great game for children to play. The baseball rule book is about three hundred pages long. So I’m not going to explain every rule here, just try and give you an idea how to play baseball. Baseball is a game between two teams. 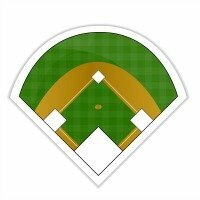 It is played on an open field that has an infield, outfield and four stations, which are called bases. Each team has nine players. Some of the equipment used is baseballs, baseball bats and baseball gloves. The objective of the game is to score points, which are called runs. To score a run a player needs to touch all four bases before being “put out”. Some of the ways a player can be “put out” is having his “hit” caught before it lands on the ground, being “forced out” at a base, being “tagged out”, or “striking out”. I will explain all those new terms a little further down. First I need to describe how the action starts. One team, the home team, starts with all nine of their players on the field. They are on defense and at this point of the game cannot score. They need to make three outs on the other team, the visiting team. The home team’s players are spread all over the field in predetermined spots, called positions. One player is called the pitcher, and he will throw the baseball to start the game. The visiting team sends a player, now called a batter, up to the first station, which is called home plate. He will use a baseball bat and try and hit a baseball that is being thrown by the pitcher. The pitcher is a very valuable player for the team in the field. He wants to throw the baseball in such a way that the “batter” makes an out. It might be throwing it fast enough that the “batter” misses the baseball. Or he throws in such a manner that the “batter” hits the baseball into the air and one of the defensive players can catch it. The pitcher must throw the baseball in an area where the “batter” has a chance of hitting the baseball. If he does not then a ball it called by the umpire, who is a referee. If he throws four times and all of them are not hittable, the “batter”, who now becomes a “base runner”, is advanced to the next station, which is called “first base”. The visiting team sends up another batter. If this base runner reaches the next three bases without being “put out”, then a run is scored. It may take one or many more batters to help this base runner score. He needs to circle around the bases back to home plate before his team makes three outs. Three Strikes and You Are "Out"
If the pitcher throws the baseball three times and the “batter” misses all three “pitches”, then the “batter” is out. The visiting teams will again send up another “batter’. When three outs are recorded, the teams change places. All runs scored before three outs are made are added to a team’s score. After the “visiting team” bats and makes three outs, and then the home bats and bats until they make three outs. When that happens, one round of play, called an inning, is completed. A baseball game has nine innings. Due to time constraints, many youth baseball games will play less than nine innings, like maybe five or seven innings. The team with the most runs scored in nine innings wins the game. If the teams are tied after nine innings, then the game goes into overtime, which is called extra innings. The game is continued until one team scores more than the other team in an “extra inning”. That is how to play baseball. Batter: a player who is at home plate with a baseball bat trying to hit the thrown baseball. Hit: when a batter strikes the thrown baseball and it goes onto the field of play. Forced Out: If the batter hits the baseball onto the ground, and the team playing in the field retrieves the baseball and throws to another fielder standing on first base, and all this happens before the batter reaches first base, then an out is recorded and the batter leaves the field. Tagged Out: If a base runner is touched with the baseball by one of the defensive players, when the base runner is not on a base, then an out is recorded and the base runner leaves the field. Standing on a base is a safe zone and a runner cannot be tagged out. This article has been a simple description of how to play baseball. There are many other aspects of the game that come into play every baseball game. If know you nothing about baseball, then you need to search out more information to really get a good understanding of how to play baseball. In countries where baseball is played, most residents will know how to play baseball. My best advice is to read this article a couple of times so that you have the basics down, then seek out a friend for further explanations.